Because of the size of this product, this is a long review. To skip straight to the scenario discussion, click here. To go all the way to the concluding “bottom line,” click here. But try the whole thing. After being neglected by much of the ASL community for some years, the PTO certainly got some love in early 2010. 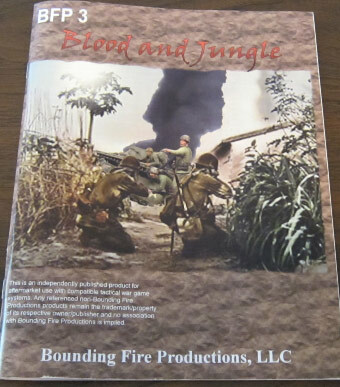 First to come out (though one should also recognize the Summer 2009 product The Long March, by Heat of Battle) was a PTO-themed issue of Le Franc Tireur, soon followed by this product, the massive Blood and Jungle (B&J). And massive B&J certainly is, as well as costly (to date, it is not only the most expensive third party ASL product ever released, but at $125 direct is the most expensive ASL product of any sort released to date). This alone might make some price-conscious ASLers wary of purchasing it, though it is not as if BFP fails to give the purchaser a lot for one’s money (see contents, above). Its other record-breaking attribute is that it comes with 47 scenarios, which is more scenarios–by quite a large margin–than any other ASL product has ever contained. A number like 47 scenarios is one that will have some people leaping for their wallets, but might make other people more cautious, as the amount of time needed adequately to playtest such a large number of scenarios is truly huge. Actually, not quite all of the 47 scenarios are original. 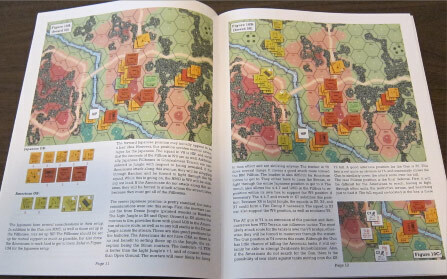 Three of the scenarios are reprints of scenarios designed by Derek Ward and published by Heat of Battle in Tropic Thunder. One scenario is a reprint of a scenario by David Longworth that originally appeared in Heat of Battle’s Recon by Fire #1. Two scenarios are reprints of scenarios designed by Steven Swann that originally appeared in Critical Hit’s Leatherneck. Still, presuming that the other 41 scenarios are all original, that still represents a significant investment in playtesting. Even assuming that no scenario was playtested more than 5 times, and even assuming no playtest took more than 4 hours (which is an underestimate, given how large most of the scenarios are), that is still over 800 hours of playtest time. Only time will tell if B&J met this arduous playtest challenge. What does one get for one’s money? The first thing many ASLers tend to look at when opening a new ASL product are the counters. Here BFP does not stint. B&J comes with 4 full counter sheets (3 sheets of 5/8″ counters and 1 sheet of 1/2″ counters). The counters are well designed and well printed and are of good quality (some hypersensitive critics might point out that they are all of the “whitecore” variety, rather than the “greycore” variety used by official counters, and that this could possibly allow identification of certain counters among a stack of counters, but such people should really just get a life). 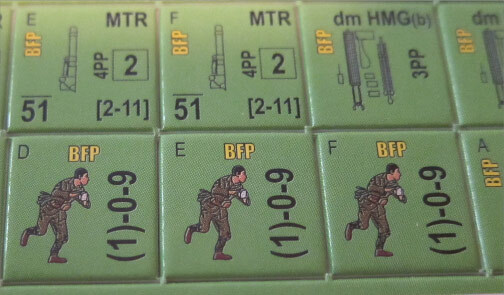 The countersheets provide additional counters for the American, British, Chinese, Japanese, and Dutch OBs, as well as counters that can be used to represent the Indian National Army, Thai forces, the Burmese National Army, and Indonesian rebels. The countersheets also provide some useful markers, such as Light Jungle, Crag, Orchard, and Dense Jungle counters, which are more flexible than overlays (and allow Light Jungle hexes in Dense Jungle scenarios, or vice versa, for example). Some other markers, such as Support Weapon First Fire markers and “No Smoke” markers, have previously appeared in other third party products. Many of the new counters represent “historical” ground support aircraft (rather than the more generic units provided in the official rules); a number of third party publishers try this from time to time. 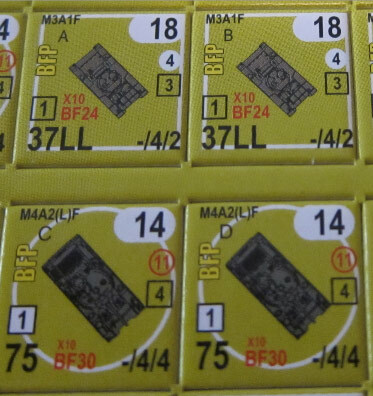 Though air aficionados probably appreciate this, most ASLers seem to be ground-pounders, and it is still not clear how popular such counters really are (though their inclusion is not harmful, in any case, and players can always just use regular ASL plane counters). 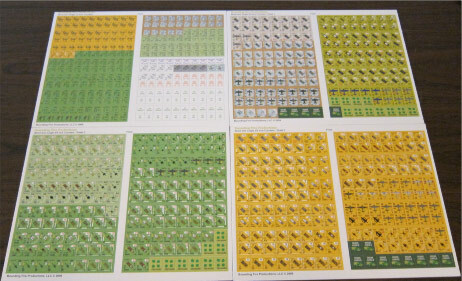 Other counters represent extensions to the Orders of Battle of various nationalities. 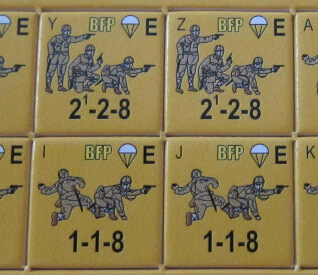 For example, various third party products have previously provided counters for German partially armed paratroopers; B&J extends this to the Japanese (who hardly engaged in any such operations during the war). Another example involves the Satan flamethrowing tank (a Stuart tank variant). This AFV was primarily built from the M3A1 and is represented as such in the ASL rules. That same rule notes that a mere handful of Satans were converted from the M5A1, but theofficial system provides no counters for them. B&J provides counters for all four of these tanks. In some of these cases, the number of counters provided is somewhat padded. For example, B&J introduces a flamethrowing Sherman variant, which it dubs the M4A2(L)F, but provides a full six counters for this AFV. It is hard to imagine a scenario involving all six of these flame-belching monsters. 2011 Counter Update: Apparently having received some criticism of their whitecore counters (which, it should be stressed, were really actually fine), in 2011 BFP reprinted the Blood and Jungle counters as greycore counters and included this complete counterset with their 2011 release Crucible of Steel. It is not clear from their website whether or not these are available separately or whether later copies of B&J included the greycore counters in lieu of the whitecore ones. The next component is the maps, of which there are three in B&J, all 8″ x 22″ cardstock geoboards, as is now standard. The maps are of good quality, with nice artwork (one particularly good touch is the addition of skylights to some of the factory buildings, complete with missing planes of glass!). One feature on one of the maps (BFP G) is not explained in the rules; these are Storage Tanks, which were introduced and explained in another BFP product, Into the Rubble. Players will immediately notice, and no doubt be surprised by, the fact that the maps are all urban maps. Map BFP G is a river board, with the river flanked by multi-story wooden buildings (probably to represent warehouses, etc.). Maps DW1-a and DW1-b are quasi-geomorphic, in that they are geomorphic on three sides of each board, but not the fourth side. The two fourth sides mate together so that the boards can combine to form a large urban mapboard. This map is a mix of wooden and stone buildings, with most of the stone buildings being rowhouses or otherwise long and narrow multistory buildings. 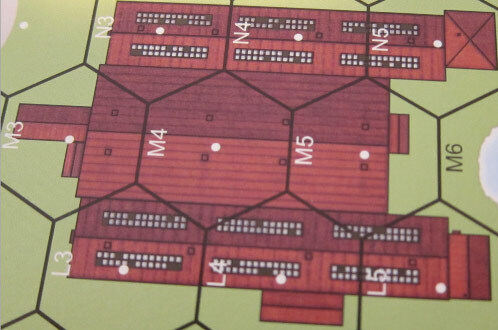 The most obvious feature of this double-wide map is the inclusion of a great many hexes filled with multiple small wooden buildings (creating considerable clutter and often restricting bypass movement). This is a useful bit of rendering which represents the cityscapes of a number of Chinese and southeast Asian cities more accurately than previous urban boards do. Incidentally, though the BFP Web site claims that this is the “first ever” double-wide map for ASL, it is actually the third such map. The first was the large hill map that came with Heat of Battle’s High Ground! The second was the village map that appeared in MMP’s Action Pack 5: East Front. Credit must also be given to Critical Hit for an extra-large quasi-geomorphic map that appeared in Critical Hit Magazine, Volume 6 Issue 4. Some boards, it can be seen, get off relatively lightly. But others are used over and over again. Board 37 in particular is used an amazing 10 times in B&J. Clearly, B&J would have benefited by the addition of a couple of new jungle compatible boards. The rules and “Chapter H” pages in B&J are nicely done, in full color and with decent attention to detail. As is frequently the case with such items, many ASLers will enjoy simply browsing through them and learning about new vehicles and weapons that were used in World War II. The one fault that needs to be mentioned is that these pages are printed on a a very thin glossy paper that is not durable and will tear easily. 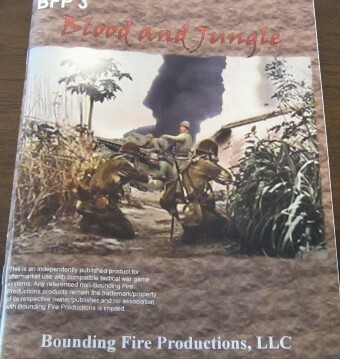 Probably the weakest single component of B&J is the magazine (titled, apparently, Blood and Jungle) included in the project. While it is printed in full color and lavishly illustrated, and is a full 60 pages long, the article content is rather weak. One article, “Pacific Terrain: The Law of the Jungle,” simply recapitulates PTO terrain rules. This is a type of article that has been done before, and doesn’t have much value over the rules themselves, in any case. Perhaps the one exception to that is that it does provide a lengthy illustrated example of how these terrain effects work together in practice. Another article provides a basic historical overview for some of the new forces introduced in the module, such as the Indian National Army and the Indonesian rebels. Another historical article introduces the Kachin guerrillas of Burma (typically referred to as the Kachin or Jingpaw Rangers), who are also given rules & scenarios in B&J. This is a worthy force to represent in ASL, as the Kachins ended up being among the best jungle fighters in World War II (perhaps matched only by Fijian troops). Unfortunately, the amount of research done on the subject was seemingly slight, and as a result, the article (and the Kachin rules) are marked by inaccuracies. For example, the article suggests that Kachin guerrillas were equipped with “ancient rifles” and were “usually not equipped with machineguns or heavy weapons.” The Kachin rules decree that Kachins cannot use any 5/8″ counters at all. The reality was very different. By the summer of 1943, the U.S. had already supplied over 1,000 Kachins with British and American weapons and this number greatly increased over time. These included the M2 carbine; Thompson, Sten and Marlin submachineguns; Bren LMGs; 30-cal machineguns; 51mm and 60mm mortars; 81mm mortars, and even 4.2″ chemical mortars, which they used as their “heavy artillery” (these mortars would be air-dropped for an operation, then destroyed by the Kachins as they were ready to move on). Indeed, by the end of the war, the Kachins had been converted into what were in effect light-infantry battalions and were used in conventional warfare to cut off Japanese retreat routes from Burma. Unfortunately, B&J does not reflect this. Another historical article, on U.S. and Filipino armed forces in the Philippines in 1941-42, is also thinly researched; its bibliography misses basic works on the subject. The one key work it does use is miscredited (its author was the military historian Louis Morton, not Orlando Ward, who was his boss). The article also tends to focus on the PA’s lack of training and equipment before the war and its poor performance in the early days of the campaign during the withdrawal to Bataan, while failing to acknowledge that the Filipinos learned quickly once in actual combat and that the US-Filipino force actually stopped the Japanese cold, forcing them to instead resort to a siege to starve out the defenders, before finally launching a second, much-reinforced attempt in April 1942. The article does accurately relate the very impressive performance of the Philippine Scouts. However, it oddly states that the American tank force (appr. 108 tanks in two battalions) was “quickly destroyed during the first ground battles early in the war.” In actual fact, half of the tanks successfully survived the fighting retreat into the Bataan peninsula and served throughout the campaign, performing valuable service all the way through the final battles in April 1942. It is clear that the magazine included in B&J represented a considerable effort in time and expense to create, but the results do not seem to have been worth that effort. It might be better to forego such an item in future products, reducing the expense to the consumer and concentrating instead on the scenarios. As can be seen from the above, B&J gives one a great range of situations and nationalities to choose from. From jungle fighting to urban combat, it can all be found here, and most of the nationalities that fought in the Asia/Pacific theaters are represented here at least a single time. The situational variety is a real strength of the pack. Unfortunately, the same cannot be said for the variety of scenario sizes. Perhaps the greatest single weakness of the scenario mix in B&J is that scenarios overwhelmingly tend to be large in size. With nearly 50 scenarios, one would think that, even if sizes are skewed, there couldn’t help but still being a substantial number of small, medium, and large scenarios alike. However, that is not the case. Of the 47 scenario of B&J, only 8 can be considered small or medium-sized. The remaining 39 are all large. Indeed, a considerable portion of the scenarios are not merely large, but very large: of the large scenarios, fully 17 of them contain at least 20 squads on one side (not counting crews, guns, or AFVs). Moreover, the bulk of scenarios also include AFVs: though set in the infantry-centric Asian theaters, 39 of the 47 scenarios contain AFVs. The result is that this is a pack full of really big scenarios that will necessarily take a long time to play. There are relatively few scenarios that are tournament suitable or can be easily played on a weekday evening. Most are instead meaty, all-day scenarios. And while such scenarios are often a welcome feast that one can really sink one’s teeth into, they aren’t what most ASLers play most of the time. BFP releases tend to have a serious bias towards large scenarios and B&J reflects this trend. This is unfortunate. 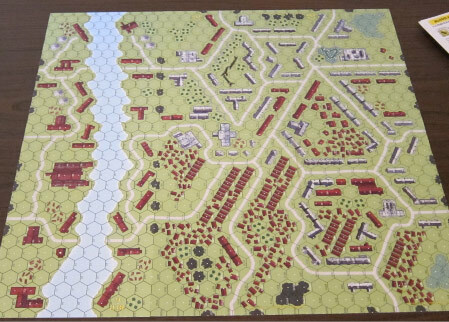 While large scenarios can be every bit as enjoyable as small or medium-sized scenarios (some might argue more so, because their very size makes them less dicey, and because they often allow players more options), they are simply not as playable. And this is where the price consideration comes into play. For a product costing well over a hundred dollars, many ASLers might prefer a selection of scenarios that they know they would have more opportunities to play. One can only hope that future BFP products will have a more reasonable scenario size mix. Five of the 47 scenarios have air support. Fully 16 of them feature OBA. No scenarios use Night rules. One scenario, BFP-56 (White Beach 1) is a Seaborne Assault. Two scenarios feature caves; two scenarios, BFP-39 (Langoan Airfield) and BFP-57 (Last Drop), feature airdrops. Six scenarios are set in Dense Jungle. One scenario, BFP-66 (Signal Hill) is a DASL scenario. One scenario, BFP-26 (Armored Samurai) uses board BFP-B from Into the Rubble. One scenario, BFP-49 (Just a Drive Along the Beach) uses the HASL map from Blood Reef Tarawa. Two scenarios, BFP-35 (Mai Phu) and BFP-33 (Kunlungan) use maps (u and v, respectively) from Advanced Squad Leader Starter Kit 3. It is important to note that 10 of the B&J scenarios use maps included in the product and 35 of the scenarios use B&J counters, so players must remember not ever to just bring the scenarios without the rest of the product, or they might find themselves unable to play the scenario they selected. This can be kind of frustrating to have to lug it all around. A number of the scenarios represent novel actions that have not been featured before in ASL scenarios. However, it should be noted that many of the scenarios depict actions that have already appeared in ASL scenarios, sometimes more than once. For example, BFP-41 (Last Cavalry Charge) covers the same action as the more well known official scenario G28 (Ramsey’s Charge). BFP-28 (Marco Polo Bridge) depicts the same fight depicted in Friendly Fire’s FrF17 (The Marco Polo Bridge Incident). BFP-31 (Chinese Alamo) treaded over the same ground that the official scenario A110 (Shanghai in Flames) and the Le Franc Tireur scenario FT137 (300) covered, while BFP-29 (Hueishan Docks) features an action previously covered by East Side Gamers in ESG36 (Havoc in Shanghai) and ESG37 (Tsunami of Maniacs). BFP-39 (Langoan Airfield) was earlier portrayed by the official scenario A85 (Airborne Samurai). BFP-33 (Kunlungan) was also portrayed by Le Franc Tireur’s FT139 (Ride of the 200th) and Fanatic Enterprises’ FE42 (Assault on Kunlun Pass). BFP-58 (San Manuel Melee) was previously depicted in the Critical Hit Platoon Leader campaign game Armored Stand, as well as Fanatic Enterprises’ FE100 (San Manuel #1) and FE101 (San Manuel #2). BFP-57 (Last Drop) was earlier covered by Critical Hit in RPII-7 (In the Samurai Tradition) and by Kinetic Energy in KE10/KE15 (Angels at the Airfield). The firefight in BFP-35 Mai Phu previously saw coverage in the ASL Journal as J90 (The Time of Humiliations) and ASL News in ASLN-42 (Welcome to Vietnam). BFP-37 (Debacle at Yeang Dang) features an action that previously had been depicted in the ASL Journal as J35 (Siam Sambal) and in the French ASL magazine Tactiques as TAC69 (Battan Bang Bang). Recorded playings for third party ASL scenarios don’t accumulate very quickly, especially for larger scenarios, so as of this writing, B&J is still in the “initial impressions” stage, though early word of mouth has been positive. Some of the scenarios do look interesting. BFP-55 (Used and Abused) had a good reputation in its earlier incarnation (2014 note: alas, it is a dog). BFP-67 (Coke Hill) is a reasonable sized scenario featuring an Australian attack through difficult terrain against an entrenched Japanese force. BFP-59 (Geki Cacti), an American attack against a small Japanese force, is interesting because of the unusual number of Japanese AFVs. Both of these seem balanced so far. BFP-60 (Thrilla in Manila) is one of the few larger city-fights in the pack without OBA; it seems pretty playable, and both sides have lots of toys. Early playings suggest it is balanced. BFP-38 (Sugar Cane Shuffle) is a well-balanced, interesting, casualty-intensive early Philippines action. BFP-53 (Grant vs. Stuart) could be an interesting meeting engagement/king of the Orchard shootout between the British and Japanese [2014 note: may be unbalanced]. And honorable mention goes to BFP-46 (The Shan Capital) for depicting an action from the rarely seen Japanese invasion of the Shan States during the 1942 Burma campaign. As of 2014, the most popular and balanced scenarios include BFP26 (Armored Samurai), BFP29 (Hueishan Docks), BFP30 (Melee Near the Coast), BFP34 (Hundred Regiments Offensive), BFP35 (Mai Phu), BFP38 (Sugar Cane Shuffle), and BFP52 (Kachin Rangers). The Bottom Line. 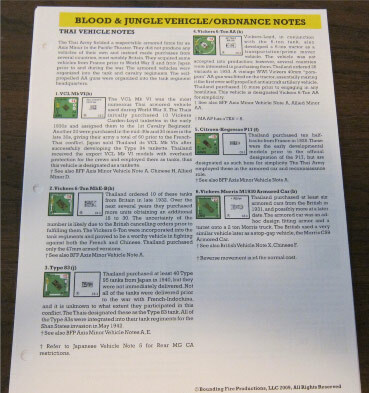 Blood and Jungle is big. It is a big product with a big price tag coming with big components and filled with big scenarios. Die hard ASLers, as well as committed fans of BFP, are likely to splurge on this without a second thought. Some people, though, might be a little shy due either to the considerable cost (too bad it wasn’t split into two products), the huge emphasis on large scenarios, or both. There is a lot here to like, though. 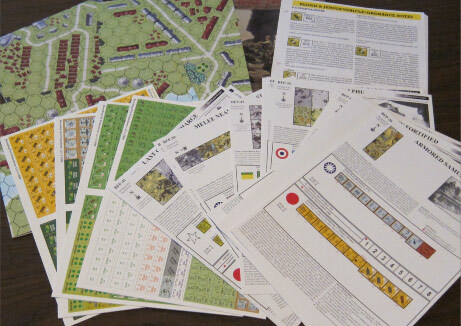 The physical components are impressive (including counters and maps), while the scenarios cover an amazing breadth of the fighting that took place in China, Southeast Asia, and the Pacific War. Many of the scenarios will no doubt provide meaty enjoyment for all-day scenario sessions. On the other hand, the magazine has good physical quality but its content doesn’t quite fare as well. Moreover, there’s a basic lack of “play in an afternoon”/”play in an evening” sized scenarios that form the bulk of what ASLers choose to play. It is this considerable lack of small and medium-sized scenarios that is probably the product’s most significant weakness. As such, it may not get as much play as many other products that come with far less in terms of components. This seems a shame, somehow. However, it does have a number of very solid scenarios that PTO-lovers will enjoy. It is very satisfying to see the PTO finally get the respect it deserves. Thanks for the detailed review. It is greatly appreciated. Size of the scenario has little bearing with online play as most online sessions are multiple meetings. Ftf is the restriction to scenarios that are large. I prefer the smaller ones, but with continued VASL play, even many of those games go more than one session, do the length, size, scope of the scenarios has less relevance. 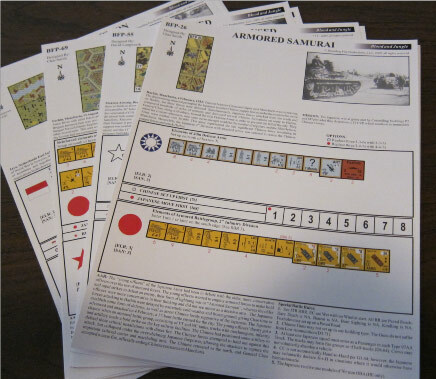 Scenario “Armored Samurai” was in an issue of The Wargamer #30 , Squad Leader PTO Variant Blood and Sand.